This initial version has been set up for Sections intended to be visible on Plan views, and will not work in other planar situations (such as running from an Elevation). Future versions could look at working on any Line in any view, and possibly allowing any plane Rotation (such as 90 degrees for perpendicular sections). Note: you may have to press Run twice to make it work, depending on your version and system? 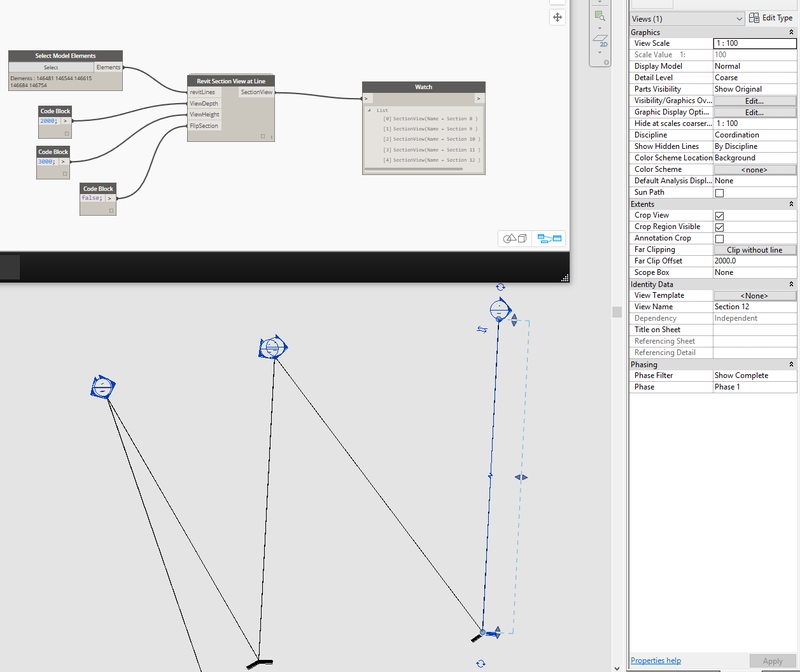 I seem to be having a hard time finding the “Revit Section View at Line” node. I have latest Bakery package. Is there some other package it might be in?? Hi Tom, I have just uploaded version 2016.3.1, it should be in there. You can also check the github page if you the Package Manager isn’t up to date. Hi, It seems to just show up Null when running any ideas what causes it? Hi, I seem to only get null under my watch list when running the script even twice. Any Ideas? Can you right click on the node and click Edit, and then check what part of the node is red or yellow? This can help us to see if something is broken. This node in latest release is not working also for me. Still working for me, did you use a Detail Line? Is it possible to align a view to a selected line? can you tell me the Package that holds this “Revit Section View at Line” node? This is in Bakery package. Thank you! I’ll have a look to see if this works for me! Hello, I’m trying to use this good function, but the “TurnintoList” node in the” Revit Section View at Line” is red. Is it possible to fix that one. Thanks a lot! Just started using this node and everything works perfectly, however I would like to pass a list of heights to the node and everything I have tried crashes Dynamo. Is it possible to have a list of view heights? The node might have to be upgraded and fixed up a bit to improve the ‘lacing’ – so that it could take a list of view heights. So it needs a bit of fixing but then it can do what you want? That sounds like it will work thank you. I have had a look inside the node to see if there was something simple I could do. I will carry on with this and I’ll let you know how I get on. I think I hit a dead end trying to update the custom nodes so I have gone back to a post by Dimitar Venkov back in October 2015. I’m making some progress with a list of view heights but the list structure is still causing problems. Dynamo file uploaded to GitHub. I’m having the same issue as the node gives null as output but it is still working. However I need the views to rename them. When you open the node the Preflight node element input is not connected anywhere. When I have pasted all node content into my work area to check what is happening the preflight node content just goes with errors due to the missing element input. Connecting the detail lines there did not help so I was not able to find out what is the issue.